Great blog, but rather sad. This shows why Yosemite National Park has many problems that Paiutes have uncovered. The blog discusses that between 1976 through 1981, when Craig Bates was working as the official Indian expert for Yosemite NPS, the Park met with the non-profit American Indian Council of Mariposa aka the Southern Sierra Miwuks. They decided instead of starting the history of Yosemite at the begining they decided to start Yosemite Indian history at 1870-1880. In other words leaving the story of Chief Tenaya and everything up to 1870 out of the early history of Yosemite Native people. Many Paiutes believe that when this was done the story of Chief Tenaya's birth and the study of his Paiute roots was now not going to be mentioned. Yet Chief Tenaya's story is the most important story of the history of Native people of Yosemite. 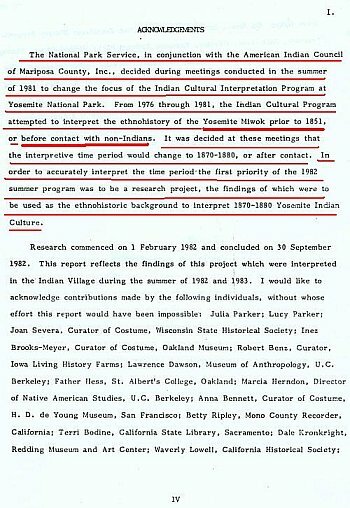 Yosemite Miwok history - Yosemite Indian Cultural Program in 1980s was flawed. "LET'S START YOSEMITE INDIAN HISTORY AT 1870, who needs to know about Chief Tenaya and what happened to the Ahwahnees prior to 1851 and at first contact. That is too messy. Why do we need to know about the EARLY history of Chief Tenaya, and let's start off Yosemite Indian history WHERE WE WANT TO". That is practically what the Yosemite National Park Service and the Southern Sierra Miwuks determined when they decided to "skip" all that 'messy' pre-history or first contact. Instead they decided to start "Yosemite History" at 1870s. In other words start off with the mistakes made by Stephen Powers about the "Yosemite Miwoks" and forget about Chief Tenaya and his Paiute history. Yet Tenaya and the prior and first contact IS THE STORY of Yosemite Indian history. From the report Ethnohistory and Material Culture of Southern Sierra Miwok: 1852-1880 by Craig Bates and Karen P. Wells. This is from the Acknowledgement of the same report named above which is very revealing. In 1981 Yosemite National Park worked in conjunction with the American Indian Council of Mariposa or the Southern Sierra Miwoks (who were mainly employees of Yosemite National Park who want to become a tribe as "Yosemite Miwoks"). Yosemite NPS relied on the non-profit the American Indian Council of Mariposa or Southern Sierra Miwuks as consultants from 1976 to 1981. Yosemite NPS created a program to do the history of the Indians in Yosemite, they wanted to start with Yosemite Indian history PRIOR TO 1851, which would have been the best thing to do get the true history of Yosemite, but it would appear the Southern Sierra Miwuks did NOT want to start prior to 1851 or at first contact. There is a reason for this. That is because prior to 1851 and up to 1900 the story would show that the early Indians of Yosemite prior and right after first contact were Paiutes from Mono Lake and not Miwoks. Miwoks were the scouts for the white military and miners for the whites. So that is why the official Yosemite Indian Cultural program started with the Indian history of Yosemite at 1870s instead of prior to first contact and 1851. The Southern Sierra Miwuks wanted to use the Eadweard Muybridge photos as their proof of “Yosemite Miwoks” but as you can see on this page that their claims of Muybridge’s “Yosemite Miwoks” was really Yosemite PAIUTES. Starting at 1870s instead of first contact we believe was probably suggested by Craig Bates and the Southern Sierra Miwuks, but the real stotry of Yosemite Valley’s Native people history started prior to 1851, but if it was really checked it then would’ve revealed the Paiutes of Yosemite as the original people and not the Southern Sierra Miwoks. Yosemite National Park states, even today, that they do not favor the Southern Sierra Miwuk American Indian Council of Mariposa, but why did the Park allow them to dicate when Yosemite Indian history in the Park was to officially start at 1870? That is what happens when a non-profit group seeking federal recognition is in charge of Indian history. They just might have their own personal reason to make everything Southern Sierra Miwok. You see what I see.This author ACTUALLY READ LAFAYETTE H. BUNNELL'S BOOK. Chief Tenaya spoke Paiute, was born at Paiute Mono Lake. Tenaya created the Paiute Colony of Ahwahnee. In other words if the official Yosemite Indian Cultural Program started in 1851 and prior it would all come up to PAIUTES and not Miwoks. * note also because of the control of the Southern Sierra Miwoks in the park they gave the false impression that the Southern Sierra Miwoks were a composite tribe of Miwoks, Paiutes and Yokuts, but in fact they were mainly different Paiute bands and Monos. The reason the Prof. Phillips says Yokuts is because of the Kaweahs. Many people thought the Kaweahs were Yokuts, but they were in fact Monos. * note also Ahwahnee is in our Paiute creation stories as one of our old homelands that was destroyed and the Paiutes left the Ahwahnee or Owahnee and scattered to other Paiute areas. Miwoks COULD NEVER HAVE ENTERED a Paiute place because they would've been attacked and killed and not gladly welcome to come and live with them before 1870. That is a myth that a group of Miwoks went to live with war like Paiutes and lived in blissful peace, unless you are writing science fiction. 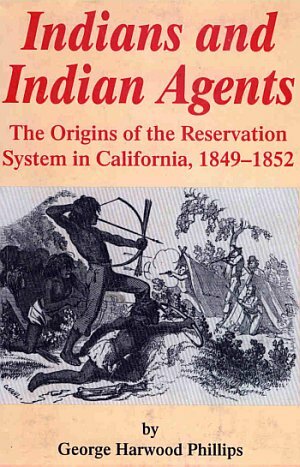 Maybe it is time to GO BACK and look at history PRIOR TO 1851 AND UP 1900 in Yosemite National Park and quit asking the American Indian Council of Mariposa, also quit relying on Craig Bates' writings. Let's look at the REAL history of Yosemite instead of helping the Southern Sierra Miwuks meet the seven point criteria for federal recogntion. That is not the job of Yosemite National Park Service. There job is to get the Indian history of Yosemite National Park correct not a service for its current and former Indian employees at the park. I wish I could read the first two acknowledgement paragraphs...they're too small for my eyes. But this is really interesting. Corruption is everywhere and it's really discouraging. I think it would be nice to find the real history in a lot of things. Abstract I transcribed it for you and everyone interested. Abstract, I transcribed that section for you and everyone that is interested in seeing the truth. I capitalized and darkened the words of interest to show what we are discussing about on this blog. "The National Park Service, in conjunction with the American Indian Council of Mariposa County, Inc., decided during meetings conducted in the summer of 1981 to change the focus of the Indian Cultural Interpretion Program at Yosemite National Park. From 1976 through 1981, THE INDIAN CULTURAL PROGRAM ATTEMPTED TO INTERPRET THE ETHNOHISTORY OF THE YOSEMITE MIWOK PRIOR TO 1851, OR BEFORE CONTACT WITH NON-INDIANS. IT WAS DECIDED AT THESE MEETINGS THAT THE INTERPRETIVE TIME PERIOD WOULD CHANGE TO 1870-1880, OF AFTER CONTACT. In order to accurately interpret the time period the first priority of the 1982 summer program was to be a research project, the findings of which were to be used as the ethnohistoric background to interpret 1870-1880 Yosemite Indian Culture." That is correct the Park Service met with the American Indian Council of Mariposa aka the Southern Sierra Miwuks and instead of starting off with Chief Tenaya and the Indian Colony of Ahwahnee...Yosemite NPS decided to start in 1870, some 20 years after his death. Do you start the history of United States after 1776, say around 1880, because you don't like what is the history of the United States is before that date. No start the History of the United States from the begining. Not where YOU want to for your own reasons. That is what happens when Yosemite NPS let the non-profit American Indian Council of Mariposa (Southern Sierra Miwoks) decide where and when the Indian history of Yosemite should start. I suggest Yosemite National Park Service go back and re-do the real history of Yosemite and quit trying to help the Southern Sierra Miwuks become a tribe.